Phew! You can breathe now!!! is the answer to what you’ve been searching for on the net! How to create and use a Science Log. Outcome Checklists for each important section of your project. Everything is at your “fingertips” with the clickable Index. Did you know that you can either do your own science fair project, use a kit or download a project from the net, but whatever you do, you still must know what the steps are and how to do them for your science fair? What are the possible reasons you have arrived here? Have you been searching for an idea for your science fair project? Are you a parent and want to know the best way to coach your child? Are you a teacher who would like more detailed information on how to guide your students in doing their science fair projects? Then look here for the teacher’s edition…. help you go through the maze of doing your science fair project? How will it give you a Winning Edge? 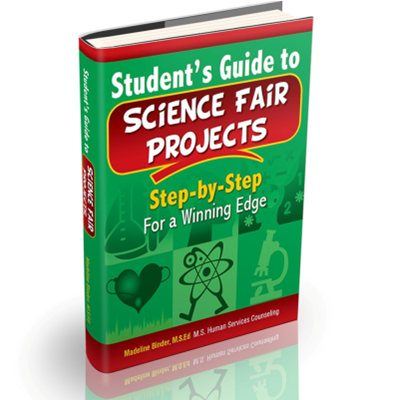 All the details of doing an outstanding science fair project, step-by-step, in an easy how-to format. 201 questions to help stimulate your imagination to create an exciting project that will keep you focused and enthusiastic for the 1 to 3-months. That’s how long it takes to do an extraordinary science fair project. Easy to understand language. All terms are defined. Lots of examples and illustrations. A unique timeline with instructions keeps you on track and alleviates panic and fear! Topic Research and how to do it. Did you know you must choose a science category before you choose your topic? How-to in this eBook. How to set a budget for your project. How to contact an expert, write a letter of inquiry and conduct in interview. How to design your experiment. How to test your hypothesis. 9-Steps and details of how to make a display board. What are the expectations of the Judges. Sample of a Judges scoring sheets. How to dress at the science fair? What to bring to the science fair? What to do once you get there? 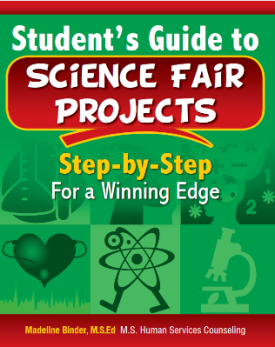 Between the above list and the one at the top of the page, you can see that Student’s Guide to Science Fair Projects is the most detailed eBook that exists on the planet! You must download the e-book from the receipt that is immediately emailed to you after your purchase. Within that email is a link to the Adobe PDF file. Click on the link to get your eBook. If for some reason you need the eBook to be sent to you as an attachment, then there will be an email address in the confirmation letter and it will emailed it to you within 24-hours. You must put the email address in your address book so that your Internet server does not read the attachment as spam. FREE download copies of Adobe Acrobat are available in the confirmation form.